In the 18th century many farmers from the Black Forest migrated to southeastern Europe. Most of them went to Banat which today is mainly located in Romania. The Black Forest did not given much to its inhabitants at the time. They were fighting overpopulation and the sparse soil. When they were recruited they were promised privileges such as free ground and years of tax freedom in the Danube countries. The journey into the unknown was for many people the last hope for an improvement of their living conditions. Back home they often lived in poor conditions and the migration was their chance for a better life. Thus, many farmers sold their property and went to Hungary to start a new life. Many people from the city of Görwihl which is located in the region of Hotzenwald in the southern Black Forest migrated to the southeast as well. Hotzenwald holds a special position in the history of migrants. Many of them did not go voluntarily and a group of wealthy farmers were deported to Banat. The county of Hauenstein was divided in districts which were administrated by the farmers themselves. When the monastery of St. Blasien expanded their rights, conflicts arose. In 1720, a treaty was supposed to decide what rights and duties the farmers had. However, this was not accepted by the peasants’ leaders. Among those who did not cooperat was Hans Fridolin Albiez. He was a farmer and nitrate maker and “Nitrate Hans” became known as the leader of the rebellions. After his death in 1727 the situation became even worse: four rebellions were overthrown by military force and the leaders were sentenced to death or forced labour in Hungary. The revolution degenerated into different sections: those who were willing to compromise and those who demanded autonomy. Among the latter was Jakob Fridolin Albiez, son of the legendary Nitrate Hans. He was deported to Banat in 1755. After his wife and his son died he returned to his home illegally but was arrested soon after and supposed to be deportet to Banat again. However, he was allowed to stay in the end and died impoberished as a 72-year-old man in 1768. Jakob Fidolin Albiez was not the only one who was deported to Hungary. In 1755, 1220 people from Hauenstein in Hotzenwald were brought to Hungary. They had to cover the costs of deportation themselves and even had to pay for the chains which hey had to wear on their journey down the Danube. Just as the poor farmers of Black Forest dreamed of a better life in Banat, the deported people from Hauenstein did not want to stay in Hungary. They were relatively wealthy and the average fortune of a deported man was ten times as high as that of a migrant. They had no reason to stay in Banat. From today’s town of Görwihl, five families were deported to Banat. 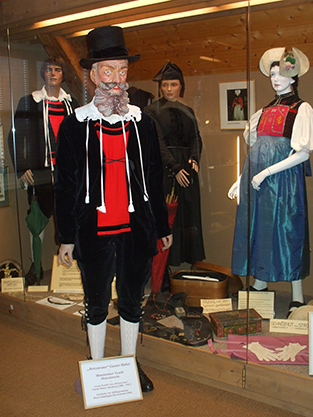 The local history museum Hotzenwald displays the region’s history and culture. 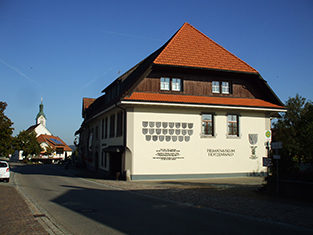 The former village school is furnished with original objects, local costume of the southern Black Forest and Information on the history of home weaving. One focus of the museum is the demonstration of nitrate making. For this, saltpetre was turned into kali-salpetre which could then be used in the production of gunpowder. Opening hours: from Easter Monday to Martini Saturday (November): Sundays and bank holidays: 2 to 4 pm. Guided tours can be arranged all year round upon previous notice.